This post is about applying the same technique I presented for ASP.NET Web Forms, but this time for MVC. 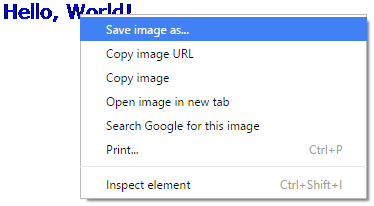 As you can see, this provides a very convenient way to generate images on the fly. You just need to learn about the drawing methods in GDI+. .NET’s Graphics Device Interface (GDI+) is Microsoft’s .NET wrapper around the native Win32 graphics API. It is used in Windows desktop applications to generate and manipulate images and graphical contexts, like those of Windows controls. It works through a set of operations like DrawString, DrawRectangle, etc, exposed by a Graphics instance, representing a graphical context and it is well known by advanced component developers. Alas, it is rarely used in web applications, because these mainly consist of HTML, but it is possible to use them. Let’s see how. Basically, this control discards the ImageUrl property and replaces it with a Data URI value generated from a stored context. You need to define the image’s Width and Height and you can also optionally specify other settings such as the image’s quality percentage (Quality), compositing quality (CompositingQuality), interpolation (InterpolationMode) and smoothing modes (SmootingMode). These settings can be used to improve the outputted image quality. Pretty sleek, don’t you think?